April 23, 2011 by Alphageek in "alphageek", "equipment"
I am going to grill something! As you can see in the picture above, I have purchased a Weber grill. Sure, I already have a gas grill, but I thought it would be fun to try something new outside. For a long time, I have been jealous of those folks you see on tv, cooking away on a charcoal grill. This will be a short, article. After all, the fun will be in using the grill, not setting it up. After I made the decision to purchase a Weber, I had to decide what model. A quick trip to their web site revealed all kinds of grills. 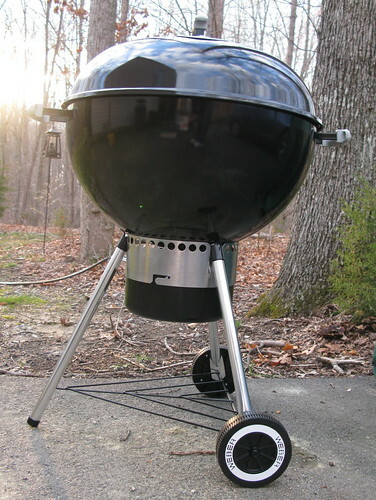 They even sell gas grills, if that is what you are looking for. While I liked some of the higher end charcoal grills, I settled on the 22.5 inch gold model. I like the gold model because it has something to catch the ashes on the bottom. Really, my decision was that simple. 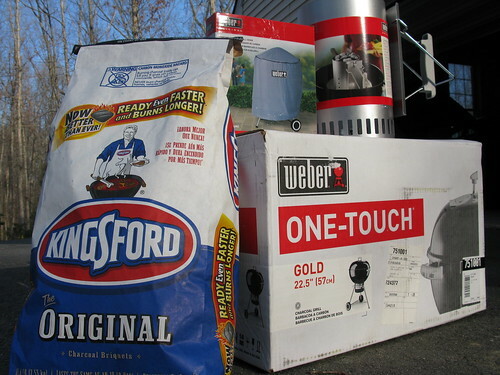 You can also buy a ton of accessories, if that is your desire, from the Weber web site. You can see the ash catcher on the picture below. I have to put in a good word for the chimney starter. Forget that charcoal starter fluid, or those quick start charcoal briquettes, you want to wad up two sheets of newspaper, stick them in the bottom, fill the starter with charcoal, light the newspaper, and walk away. When you return in about ten minutes, you will see the charcoal is ready to be spread in the bottom of the grill, for you to begin cooking. I decided to fire the grill up and cook something to show Mrs. Alphageek what I had accomplished. I guess I should have checked the weather report, because it rained. She usually does that for me, but I think she decided to let me go on my own on this one. 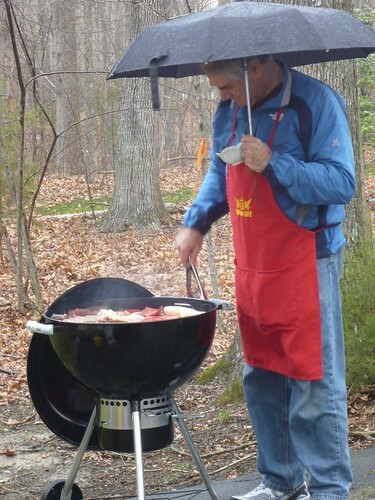 You can see me grilling in the rain in the picture below. Just remember, the food was great and I will be coming back with some more articles on the grill as the spring and summer progress.